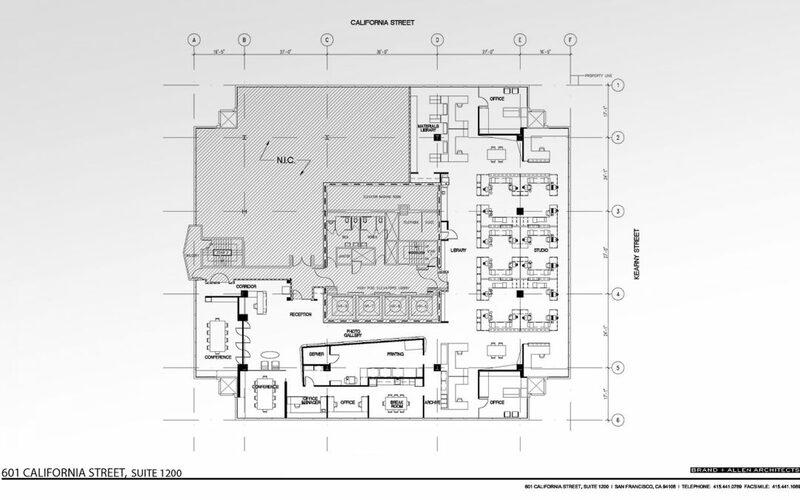 The Space Place represented Brand + Allen Architects, Inc. in their relocation to 601 California Street. When Brand + Allen Architects (B+A) approached us, their lease expiration at Ghirardelli Square was approaching and the new ownership was preparing to retrofit the upper floors into what has now become Fairmont Heritage Place, Ghirardelli Square. While a renewal was not possible, the ownership was interested in relocating B+A to other space in the Square… but we needed to move quickly. B+A really wanted a light, bright creative space. We were directed to pursue alternatives in the low-rise North Waterfront and Jackson Square areas, seeking “creative space” in brick-and-timber style buildings. They were willing to consider central Financial District highrises, provided they could fulfill their aesthetic vision within their new space. After our initial survey, B+A grew frustrated with the quality and inefficiencies of the older buildings in the lowrise “creative” neighborhoods and gravitated, instead, toward the historic landmark International Building, 601 California Street. B+A was attracted to the base building architecture and optimal floor depths, which were most accommodating to their desired studio layout, and the extensive use of glass in their prospective space. The landlord was more than willing to meet B+A’s needs by offering a 10-year lease average at just under $26/sf per year, with options to renew and expand as well as a $53/sf tenant improvement allowance. B+A completely personalized their space by developing from a shell condition using materials from vendors that they’d worked with on other projects. The end result is an imaginative environment that truly reflects B+A’s culture and capabilities. Because we know the San Francisco commercial real estate market so well, we’re able to help our clients fulfill their vision and make their new space their own. Read what Brand + Allen Architects has to say about our work.